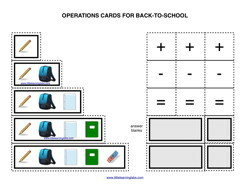 These basic operations cards can be used to teacher addition, subtraction, or counting. There are enough pieces to do several problems at once, and you can make the problems having blanks that students have to fill in. Numbers go from 1 to 10 symbols. Print more for more options. This set is done with a fun Back-to-School Theme. 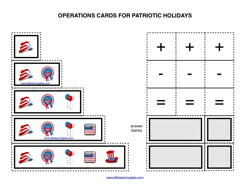 This set is done with a fun Patriotic Theme for Veteran's Day, Independence Day, or other Patriotic American National Holidays.. These basic operations cards can be used to teacher addition, subtraction, or counting. There are enough pieces to do several problems at once, and you can make the problems having blanks that students have to fill in. Numbers go from 1 to 10 beach balls. 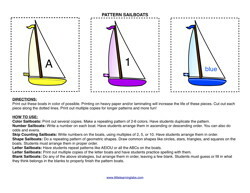 Print more for more options. 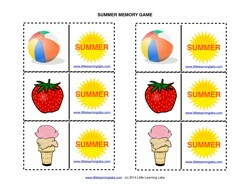 This set is done with a fun Summer Theme. 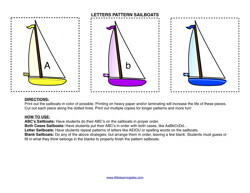 Practice making patterns with shapes, letters, colors, numbers, or anything you can think of! 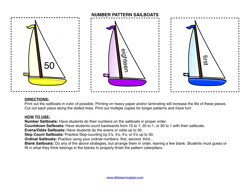 Included are 6 different color sailboats, which you can write on, and 6 B&W boats, in case you can't print in color. Several activities are included, but you can make up your own, too! Practice making patterns with letters. Both cases from A-Z are included. Practice making patterns with numbers. Numerals from 1-30 are included, There are also number words from 1-30 and ordinal numbers from first to twelfth.